Researchers from the Universities of Bristol, Cambridge and Oxford examined the diets and lifestyles of men, with and without the disease, aged between 50 and 69. In the first work of its kind, they developed a prostate cancer 'dietary index', comprising of dietary components that have been linked to prostate cancer. Men with optimal intake of the three components - selenium, calcium and foods rich in lycopene - were found to have a lower risk of developing prostate cancer. Eating the recommended five servings of fruit or vegetables or more a day was also found to decrease risk by 24%, compared to men who ate two-and-a-half servings or less. 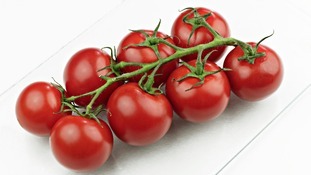 She said: "Our findings suggest that tomatoes may be important in prostate cancer prevention. "Men who ate more than 10 servings of tomato based products per week, compared to those who ate less, saw their chances of having prostate cancer development reduced by 18%. "We also found men who ate more fruits and vegetables had a reduced risk of prostate cancer. "The risk reduction figure for men who ate five or more portions of fruit or vegetables, compared to those who ate less than two and a half portions, was 24%. "We suggest that men try to get the dietary components from whole foods rather than supplements. "Even though we found tomatoes and tomato products did have this reduction in risk, we still advise men to have a variety of fruits and vegetables, stay healthy and active and maintain an ideal weight." Rates of prostate cancer are higher in developed countries, with some experts believing this is linked to a Westernised diet and lifestyle. To examine this, the researchers assessed the diets and lifestyles of 1,806 men aged between 50 and 69 with cancer, compared with 12,005 cancer-free men. The data was taken over an eight year period, from 2001 to 2009. The team examined previous research and dietary recommendations linked to prostate cancer and developed the 'dietary index' of selenium, calcium and lycopene rich foods. Their work suggests men should aim for 10 or more portions of tomatoes each week, between 750mg and 1,200mg of calcium a day and between 105mcg to 200mcg of selenium daily. Selenium is most featured in Westernised diets in flour-based foods such as bread and pasta, while calcium is most found in dairy products such as milk and cheese. The researchers are now calling for further research to develop additional dietary recommendations to help prevent prostate cancer. "We have to be very careful about this research because we have found a link, it is not a proof of causation," Miss Er added. "Further studies need to be conducted to confirm our findings, especially through human trials." The research was carried out at the National Institute for Health Research Bristol Nutrition Biomedical Research Unit in Nutrition, Diet and Lifestyle at University Hospitals Bristol NHS Foundation Trust and the University of Bristol. 'Adherence to Dietary and Lifestyle Recommendations and Prostate Cancer Risk in the Prostate Testing for Cancer and Treatment (ProtecT) Trial' is published in the medical journal Cancer Epidemiology, Biomarkers and Prevention.